I wasn't sure about this when Wayne said he wanted to design and build his own hatches. We have specked our new aluminum 24-meter passagemaker Möbius to have 10 hatches and as we all know, there is nothing worse than leaky hatches. I was worried that they would all be rev. 1 of my husband's design. But I've got to hand it to him now. Though they are not done yet, I am impressed. And our Turkish welders can sure do some pretty work. Although built out of wood in that era , The Maurice Griffiths double coaming design as chosen for smaller 30-40 ft sail cruisers that would have decks awash in heavy weather. A stock factory hatch has the advantage of easy replacement if damaged. How do you adjust the "squeeze" on the gasket/seal? I presume there is some threaded adjustment on the dogs? What about the hinge end? I've never had to adjust then, but I think manufactured hatches and lights have some sort of eccentric pin on the hinge to adjust spacing? He has gutter drains, described in the more detailed blog posting. One design goal was to have the hatches be flush with the deck, and an overlapped design like your picture was precluded by that goal. I'm not defending the choices one way or another, just noting that he did give it a lot of thought and made conscious decisions. Hi Peter, thanks for taking the time to look this over and add your comments. Much appreciated. I've wrestled with your point about being able to adjust the squeeze on the hatch seals and have gone with a two part solution. First is that the seals I am currently planning to use have a good amount of “squish” to them and are not supposed to take any “set” over time. These edge seals have two parts to them bonded together and you can see examples of them HERE. I will put in more details about these seals and the drains and other aspects of these hatches in an upcoming update on the Mobius.World blog which will show this more clearly but here is how I have designed these hatch seals to work so far. The lower part is an upside down U shape which slides over and grips to the top edge of the 8mm thick inner Frame. This U shaped part is made of PVC plastic with an inner aluminium U shape which along with barbs on the inside of the PVC grips the aluminium frame edge. This can also be glued on if needed. The 2nd upper part is a hollow EPDM tube which is bonded on top of lower U part that creates an 11mm OD “bulb” that will be squeezed by about 50% which is the recommended degree of squeeze for ocean level hatch sealing. As per the design of how the Lid is recessed into the “gutter” area between the Inner and Outer Frames and sits flush with the decks these seals won’t be subject to any direct high pressure hits of green water coming over the decks and should only have to deal with some momentary water that comes through the 5mm gap between the Frame and the Lid before all this water is drained away by the two 20mm ID drain pipes coming off the bottom of the Gutter on both sides which will take the water either down and out through a sea chest or perhaps straight out the side of the hull under the Rub Rails. The second backup option, which I’ve designed for but will hold off implementing until after I have had a chance to put the above solution to the test with some high power fire hose wash downs, is along the lines of what you mentioned with having an ability to adjust the hinge side height of the Lids which would let you adjust the amount of squeeze to the gaskets on that side. The opposite Latch side has the typical built in squeeze adjustment of most hatches with the angled surface that the Latch handle “nose” bears against as you turn the handle more. I modeled a design like you suggest with eccentric bushings where the SS pin passes through the two side of the Hinge Box but an eccentric would move the pin both horizontally and vertically as you rotate it and I don’t want to change the gap between the Lid and the Frame by moving the Lid horizontally so I didn’t think that design would work as well. I modeled quite a few different methods of adjusting the vertical position of the hinge pin which would in turn adjust the amount of squeeze on the hinge side and have decided to go with one of two options that would let me change the amount of squeeze on the Hinge side. Option A is the simplest if I find that the gasket needs to be squeezed more to fully seal the hatch under all conditions then I could remove the hatch seal and shim the upper edge of the 8mm Inside frame that the gasket sits on and reinstall the hatch seal or put on a new one. This would keep the Lid in the same position and raise the bulb height which would cause it to be squeezed more. These hatch seals allow for this kind of remove/install cycle but I will carry a full length of this hatch seal for spares so can easily put on a new one if needed. Option B is a bit more complex where I would change the shape of the two holes in each side of the Hinge Box where the SS hinge pin goes through from round to a vertically elongated slot. This pins would thus be able to move up and down but not sideways, so the Lid stays centered within the Frame but can be moved up and down with the SS pin moving vertically in this slot. 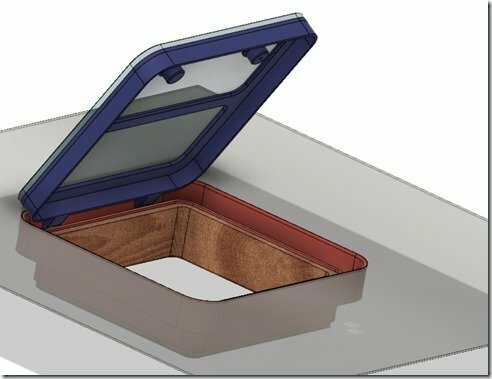 We have CNC cut the 10mm Lid frames to have four “tabs” where the rotating Latch handles attach with two on the typical side opposite the hinges and then two more on the hinge side. Having these four adjustable Latch Handles would let me adjust the squeeze as much as needed along all four sides of the Hatch Seals. If the design and the seals work as I hope, they will work as we are building them now and we won’t need either of the second Options A or B, but I thought it would be a good idea to design and build in these options just in case. Pretty easy to do now compared to later. Really do appreciate you taking time to critique these hatches and I would welcome any additional concerns or ideas you or others think would improve this design. Sorry for not including more details on this XS and I will cover this more in this week's progress update on our Mobius.World blog. Peter kindly provided the missing details (thanks Peter!) which is that there are two 20mm ID drain pipes on the bottom of the "gutter" area where any water coming through the gap between the edge of the Lid and the Frame will be drained away through pipes leading either to one of the exit sea chests or directly out through AL pipe exits through the hull just under the Rub Rails. The flow rate on these drain pipes should be sufficient to eliminate any standing water in this area other than for a very short time when a large amount of green water is washing over the decks. In these conditions you would have the hatches all battened down anyway and so anytime you are opening the hatches there would be no standing water there as it will have all drained away. This gutter area is quite large, 40mm wide x 40mm deep so they would be able to hold a reasonable amount of any water that somehow accumulates and there would be no "glug" or drips coming into the cabins below. All just design theory at this point I realise, but I think the design is pretty straightforward and bulletproof so we'll see how the testing goes once we have these hatches installed. It’s great to see so much thought out into this. Sounds like you have a really good plan. BTW, I was really surprised by the Gardner’s fuel efficiency. I have always believed that newer engines are more fuel efficient, not less so. Possible exceptions are for after treatment incineration which consumes fuel not benefiting power output. But if that consumption graph is accurate, it’s as much as 20% more fuel efficient. That’s just the opposite of what I would have expected. And related, how do all the EU and US emissions requirements work with the old engine? For some reason I thought that a new boat with old grandfathered engine wasn’t acceptable. But it would seem that it is OK? The French Goiot hatches that can be opened either forward or aft are a delight as the hinge pin does not need R&R to function. In trade zones the AM breeze can be minor , but by PM it can blow to hard into the cabin. No offense, but the title is misleading: you designed them, but the Turkish shop built them. Most folks do not have access to a shop equipped to cut roll, bend and weld aluminum in that thickness. Nor do they have the skills to do so either. 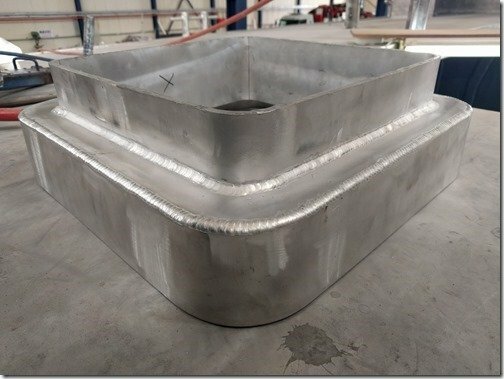 So far we have no idea if designing and building ones own hatches is a good idea since you simply had custom hatches fabricated by experts to your design. Unless, of course, you did do all of the fabrication and the Turkish crew just let you use their equipment. Are you sure they are TIG? The beads look similar to those on Japanese motorcycle frames and those are robotic MIG welds. Production jobs where the welds are measured in hundreds of yards of bead are usually done with wire feed welders as opposed to a TIG torch and alloy rod. Although low labor costs in Turkey may make it feasible to TIG an entire boat. Just going by what's in the blog article. The tacks were MIG - you can see the torch. But the final welds were said to be TIG. I can't remember if the torch was visible or not. I can't tell the difference visually looking at a bead. The tacks are MIG (Conductive wire fed thru the torch melted as the trigger is squeezed) The final welds are definitely TIG welds. Tungsten heat source and the filler may be added externally by the welder. TIG does not always require the welder to add filler. Typically TIG is a lot hotter and adds the possibility of distortion due to non uniform cooling. When I worked in the motorcycle road racing business we used to joke that Suzuki put the welds on their GSXR frames with a caulking gun! If the bead is thick and heavy, I usually assume it is MIG. The whole design, with the hatch being flush with the deck, and the lid sunk in that bucket, relies on drains to carry the water away. The drains plug or don't drain fast enough it puts the seal under hydraulic pressure, seals better be good. Lots of welding, hard to not get a bunch of distortion, so you don't end up with flat surfaces to seal. Those welds are just wire feed mig, they look ok nothing special. I'm assuming the boat is being built by professionals, they should know how to weld, it's their job. Thanks for the very kind vote of confidence Peter. Means a lot coming from someone as experienced as you. Yes, these Gardner engines really are amazing aren't they! Hard to believe that in spite of their age, ours is now almost 50 years old and yet it is still one of the most thermally efficient production diesel engines every produced. I covered more on this in an early post you may have read where I talked in more detail about these Gardner engines which attain just a hair over 40% thermal efficiency. Paired with our Nogva CPP prop that will let us dial in our load to optimal conditions at any speed and in any conditions we expect to achieve some incredibly high overall efficiency and low fuel burn. Plus I'm an old gearhead from my days wrenching HD rigs, hot rodding cars and motorcycles and restoring antiques so to my eyes these Gardners are like mechanical works of art. I understand how and why priorities changed over the past 100 years or so and HP became so much more important than torque and HP to weight ratios also became important, but I do think there has been a bit of loosing sight of the forest for the trees. HP has the factor of time which torque doesn't and so RPM's had to keep going up as the engine manufacturers chased after more and more HP, which they have done an amazing job of. But there are a lot of collateral consequences of this with lighter and lighter moving parts, smaller bores with shorter strokes such that modern engines are running with much higher overall "stress" and closer and closer to the limits of metallurgy and physics. These newer engines are still marvels of engineering to me as well with their performance and longevity. However for our application in our XPM boat, I think this very robust, slow revving, high torque engine coupled to the controllable pitch prop will give us far superior overall efficiency. One of the more interesting things to me is the shift in the metrics for measuring "efficiency" and pollutants. I won't go into it here but my reference to the forest and the trees syndrome is in part related to how most of the pollutant measurements are in absolute PPM kinds of measurements and not in the overall outputs of an engine relative to a given task. Our Gardner will definately have higher PPM counts for things like NOx etc. but we will also burn far fewer liters on a passage than would a modern engine driving the same boat at the same speeds. I'm certainly no expert in this but my logic and math says that in this like to like comparison of boat and passage our Gardner 6LXP will produce less overall pollutants for a given passage than would a modern engine and that seems to me to be a truer kind of efficiency or at least one that I prefer to have. Your understanding of requirements for old engines in new boats is quite correct for a production boat that will be registered in the USA and many other countries. In our case our boat will not be registered in the USA and so our overall boat will meet CE certification for everything but the engine. This suits us just fine as we intend to own and sail her for many decades to come. If/when we do end up selling, the rules as I understand them are than in most countries including the US, EU, etc., when selling a boat that is more than 5 years old the engine requirements do not apply and the "grandfathered" older engines are not a problem. This is certainly not a route that most others would want to follow but that is how we are proceeding. Future XPM owners will be going for modern engines from the likes of JD, Scania, CAT, Cummins, etc. which will be great choices and serve them very well. BTW, your recent posting going over how you made your engine decisions for the main and auxiliary engine in your new build was excellent (as usual) and I learned a lot from reading it several times. It still surprises me that there is such a big difference in radiated heat from these different engines you considered and I'm still a bit puzzled at this. For our boat and engine I've chosen to design an engine room that is dedicated entirely to just the engine and everything else lives outside of it in my "Workshop" area. I've focused on having this much smaller space be extremely well ventilated and be easily able to keep the ER air temps down to well below a Delta T of 25 which I think will work out very well for our mighty Gardner. Looking forward to continuing to follow your new build and learning from you as I do Peter. Thanks for all your input here as well. Yes, those Goiot hatches are beauties aren't they. I looked at many of them in my researching of great hatches and features and would have gone with a hinge/latch system similar to what they and the Bomar's have if I were going to build hatches that were raised well above deck level. However I decided to set my hatches flush with the decks as my modeling and testing showed that this design would have much lower pressures exerted on the seals themselves and be more likely to meet my goals for a completely leak proof hatch. We have spent many nights and years in the trades so we can definately relate to your comment about the changing breezes. In our case we will have Dorade box venting in addition to our hatches so when the breeze into our living spaces becomes more than we wish we will be able to simply close the hatches and have the air supply via the rotatable Dorade cowls. In our experiences so far we have not had very many occasions when the breezes were too much for us but we think we have a solution either way in our new boat. The welding on the hatches and the boat in general uses a combination of MIG and TIG. As several of you have noted here we have used MIG for tacking and for the long continuous welding situations such as all the hull welds, whereas TIG is used for final welds in shorter runs and in tight situations such as when welding AL pipe and tubing intersections for things like our arch, railings and our hatches. Sorry for not being more clear on this in the blog posting and I'll try to get the applicable welding gun in use into my photos and videos than I have been. Quite right that this flush design does depend upon the drains to remove any water that collects in the gutter area below. I spoke with several manufacturers and owners who have flush hatches on their boats with a similar dependency and didn't find any who had ever had a problem with their drains blocking up or their flush hatches leaking. In my design I took this requirement very seriously and have 2 or 3 drain pipes out of the bottom of the gutter plate, each one being 20mm ID pipe. I think these will quickly and easily drain any amount of water that makes its way into the gutters in high seas and I don't think they will be at all prone to clogging but of course I won't know for sure till we've been out there for a few years to put these hatches to the true test. Good points as well about the potential for distortion from the welds around the perimeter of these hatches. I've just put up this week's progress update posting on our Mobius.World blog and in there I've shown how we've dealt with this by milling the top edges of hatch frames after they were all welded up as an assembly. If you have time to check this out you will see how hhis enabled me to ensure that the upper edge of the outer frame that is welded flush with the deck and the similar edge of the inner frame which is where the hatch seals register, were completely flat and in parallel planes to each other. As you noted this is critical to having perfectly flat surfaces to seal and have the exact same "squish" of the gasket all around. The welding on the hatches was a combination of MIG for the tacks and TIG for the final welding and our welders are true craftsmen and professionals so we are very happy with their work and they and our entire "Team Möbius" are very special to us. Springs to assist opening and some hold open system make life much easier. It is getting difficult to tell the difference between Pulsed MIG and TIG welds just by the weld bead, like this example off Millers site.